Activities + Events & Traditions Hits for Kids Shopping What to Do on a Rainy Day? During the summer season, the Regional Tourism Offcie - Central/Western Luxembourg, in collaboration with regional actors, organizes various guided tours. 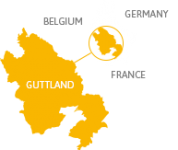 Discover the Guttland region with a tourist guide from July 15 till August 31! Discover the terraced French gardens situated in a natural environment in the Eisch valley. The gardens comprise a variety of plant species, fruit trees and grand fountains, but also a collection of sculptures, such as the so-called “mythological alley”, which assembles 10 sculptures of Greek and Roman mythological characters. Starting from the “Michelsplatz” (Michel square), where the city's landmark, the “Michelsturm” (Michel tower), is located, this historical tour takes you along many of the city's attractions. Under the expert guidance of a member of the Historical Society of Mersch, you will discover, amongst other things, the city park, the decanal church and the museum in the castle chapel. Interesting facts, exciting anecdotes and ancient legends await on this journey back in time. The route will be adapted to the wishes of the participants and to the weather conditions. The participants visit the remains of the Villa Rustica in Goeblingen. Built in the early 1st century, the estate comprised at least seven stone building and a wall enclosing an area of 5 hectares. Still visible today are the remains of the luxurious villa, two residential buildings, a little temple and three buildings used for agricultural purposes. From 1458 – 1914, Nospelt was the centre of the Luxembourish pottery industry. The residence of the last potter of Nospelt nowadays houses a museum and during a guided visit you can get to know the secrets of this old craftsmanship, and marvel at old pottery items. Nospelt is mainly known for the "Emaischen" festival on the Easter weekend, when everything revolves around the “Péckvillerchers” (little birdshaped whistles made out of clay). Some “Péckvillerchers” are of course also on show in the museum. The old mill of Beckerich, located at the end of the village, has been lovingly restored. The former home of the miller now houses the Ancient Crafts Museum, in which the participants can discover a variety of historical tools. A special highlight is of course the restored turbine, which is still working today. In the adjacent building the former sawmill is located, which houses numerous machines, which have been restored by volunteer workers with love and skill. During this guided tour of the rural museum Thillenvogtei, which is located in the smallest village of Luxembourg, visitors can travel back in time, and discover former life and agricultural work in the countryside. The activities on offer range from baking bread to attending school classes. The birthplace of the Luxembourgish geologist Michel Lucius houses a small museum in which the participants can learn more about his life and his research. They can also discover how a geologist works, how to decipher a geological map, and which stones can be found in and around the museum. Optionally, before the guided tour of the museum, the visitors can discover the thematic path dedicated to Michel Lucius and/or subsequently take part in a guided tour of the nearby water tower. It offers not only an impressive view but also houses an interesting geological exhibition. The impressive ruins of the castle with its two towers, connected by a contemporary steel bridge, are located in the midst of the village. During the guided tour, there is a lot to discover, be it up high on the tower, down in the crypt or outside in the medieval vegetable garden. A special highlight: The didactic cultural trail in and around the castle was especially designed for visually impaired people and has been created under UNESCO’s patronage. The "Raschpëtzer" qanat in the forest of Walferdingen is an underground aqueduct system for drinking water supply. This aqueduct is one of the most imposing and best preserved tunnel structures of Roman origin in the region north of the Alps. It impresses mainly by its dimensions with an estimated total length of approximately 600 m. Discover this significant relic of Roman engineering with an expert tour guide who can tell you all about its origins. Discover the techniques and traditions of the art of distilling from its beginnings to the present. You will be given an insight into traditional craftsmanship and the social life of former days. At the end of the visit, you get the opportunity to taste the liqueurs made in-house. The 375 ha large wetland Schlammwiss in Uebersyren is the largest, connected reed area in the country. Discover this unique nature reserve, where you can experience first-hand the ringing of the birds. A sturdy pair of waterproof shoes is essential. Follow us on a nocturne guided tour and discover the secrets and myths of Useldange Castle. We will guide you through the histories and legends of the medieval castle complex in a very special atmosphere. Some surprises will await you on the path! Guided torchlight tour in Luxembourgish with Francis Delaporte und Nicolas Schweicher at the „Kuelebierg“. Musical break in the chapel "Kuelebierg” at 22 o’clock. Food (“Bouneschlupp” - Luxembourgish bean soup) and drinks is provided. Discover the remains of the Villa Rustica located in the forest between Goeblange and Simmerschmelz in the flickering light of torches. Discover this unique nature reserve and its bird ringing station by night. A sturdy pair of waterproof shoes is essential. During this guided tour by night you will discover the historical path of Kehlen in the flickering light of torches. The main attractions of the town of Mersch are illuminated at night, allowing visitors to discover the most important histori cal sights in a very special atmosphere. This guided tour focuses on the element of water in all its forms. The waterworks (SES) supplies the water reservoirs of the connected municipalities with drinking water. A definite highlight at the end of the tour is the panoramic view from the top of the water reservoir by sundown.